Arrange chicken on half of each tortilla. 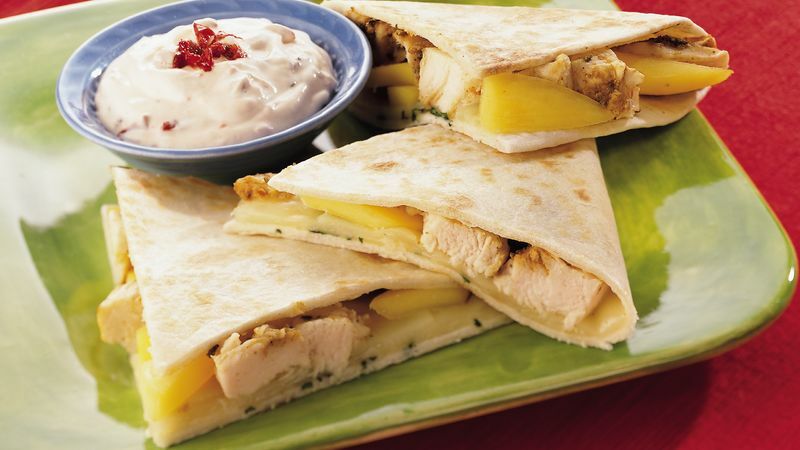 Top each with mango, cheese and cilantro. Fold remaining half of each tortilla over filling. Spray large nonstick skillet with nonstick cooking spray. Heat over medium-low heat until hot. Add quesadillas 2 at a time; cover and cook 4 to 6 minutes or until tortillas are toasted and cheese is melted, turning once. Meanwhile, combine sour cream and chiles; mix well. Serve with quesadillas. Purchase firm mangoes that give slightly when pressed. The yellow skin should be blushed with red. Look for chilled jars of mango slices in the produce department. Using these sliced mangoes is a great time-saver; drain then well before using them. Leftover grilled chicken can be used in place of the frozen chicken. For a change of pace, use Brie in place of the Monterey jack cheese. Mangos are an excellent source of the antioxidant vitamin A. These quesadillas make a great light supper. Serve them with a mixed green salad.